I am using Visual Studio 2015. I have an MVC application that I need to only deploy portions of the application, if possible. Is it possible to deploy only a certain controller and model? Thanks for any information. Yes, if you used copy deployment (i.e. deployed all project files). >> if possible. Is it possible to deploy only a certain controller and model? Our deployment action is run after build action. After building our project, all the managed code will be complied to a DLL file. We can't determine which controller or model should be complied to a DLL file except we exclude this controller or model from your project before build your project. In deploy process, we can only determine which file should be deployed or not. 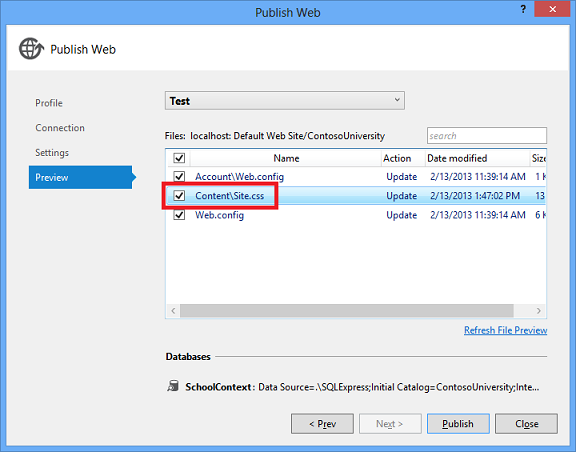 When you use the Publish Web wizard to publish the project, you can see what changes are going to be published by double-clicking the file in the Preview window. Hello, thanks for the information. I am using VS2015. Mine is not displaying a Preview Window.